Published in the British Journal of Criminology on the anniversary of the murder of Lee Rigby, the study, which used Big Data to measure the online reaction to the murder of the Fusilier, showed that online hate speech (cyberhate) has a ‘half-life’ which has significant implications for police and policy interventions in terrorist events. 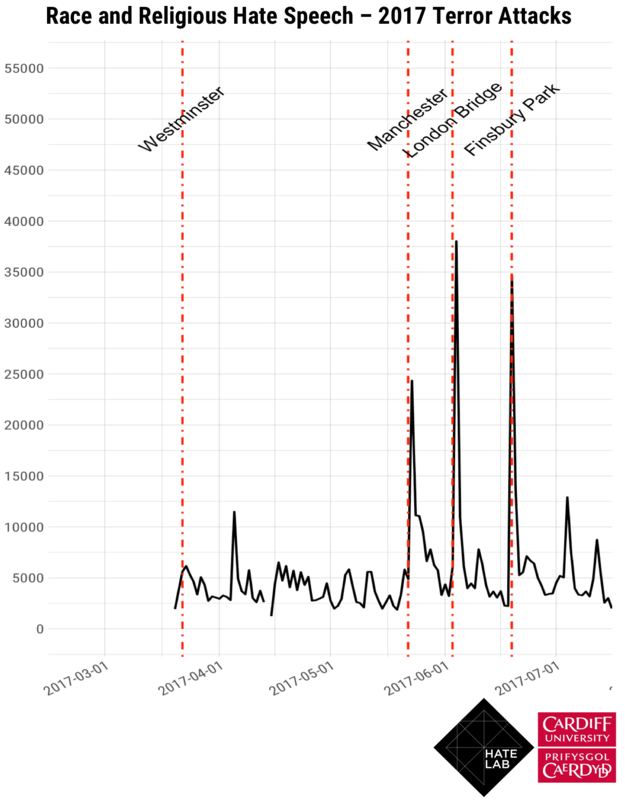 It found that cyberhate in the aftermath of the Rigby murder peaked in the first 24 hours following the attack before declining sharply over the 15-day analysis window, suggesting that police need to focus their interventions on this stage to maximise the fight against online hate. The project was carried out using the ESRC-funded Cardiff Online Social Media Observatory (COSMOS) software developed by the Social Data Science Lab at Cardiff University. The new research focuses specifically on the production and spread of racial and religious cyberhate and the Twitter battle between police and far-right political groups in the first 36 hours following the attack. The research showed that tweets from police and the media were around five times more likely to be retweeted compared to all other tweets from other users following the attack. It further suggests that the dominance of traditional media and police information flows on social media indicates these are likely effective channels for the countering of rumour, speculation and hate. The article builds upon previous research by Professor Matthew Williams, HateLab Director, and Professor Pete Burnap, HateLab Computational Lead, which showed that tweets containing positive sentiment were more likely to be retweeted than those containing negative sentiment following the attack. Professor Matthew Williams said: “This pattern reflects offline cases of hate crime following similar events, such as the Bali and Madrid bombings. We concluded that cyberhate has a ‘half-life’ following crime events of national interest. The sharp de-escalation of hate can be explained by post-event media and police Twitter messages that have a defusing effect and counter-speech from everyday Twitter users that challenge abusers. The research also showed that far-right political groups and individuals were quick to use the attack to further their cause, and were more likely to produce tweets containing religious and racial cyberhate. Tweets from these groups and individuals were more likely survive (be retweeted over longer periods) in the first 36 hours following the event, but were less likely to be retweeted by a large amount of Twitter users. An open access version of the paper can be found here. Cardiff University © 2019 Copyright.